The Flock of Birds quilt block is another example of using simple shapes and rotations to create a new look. 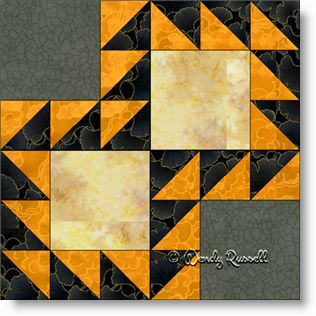 This quilt block contains only squares and half square triangles so on the surface, it is an easy block. However, I have added it to the category of intermediate difficulty because care must be taken to achieve an accurate quarter inch seam allowance in order for the patches to match up where needed. The two sample quilts illustrated show just how different your quilt can be from someone else's. By rotating the individual blocks, whether you set them in a straight, side-by-side setting or on point, the looks you can achieve are endless.